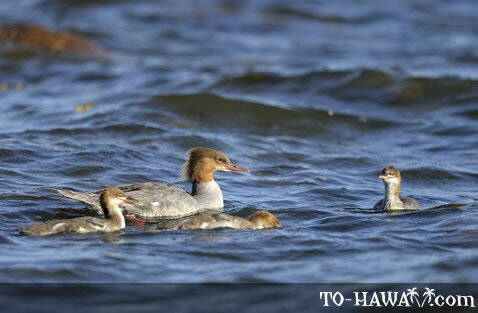 The common merganser is a large duck that eats fish and nests in holes in trees. Males are slightly larger then females and when in breeding season can be easily distinguished from females by their white body with a salmon-pink tinge, black head with a green gloss, grey rump and tail, and white wings on the inner half and black on the outer half. Females and males in non-breeding season are mainly grey with a reddish-brown head, white chin and white feathers on their wings.